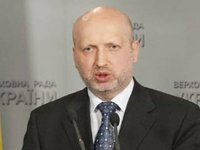 The Russian authorities need an armed conflict in eastern Ukraine to divert the attention of Russians from the crisis in Russia itself, Verkhovna Rada Chairman Oleksandr Turchynov has said. "Sooner or later the 'propaganda frenzy' will pass, and the Russian people will see that their authorities needed the war with Ukrainians only to divert their attention from the crisis in Russia itself, where a totalitarian curtain is currently being re-hung at a hysterical pace, in order to fence their citizens from democratic and civilized values, depriving them of any chance of development and a worthy life," the speaker's press service quoted him as saying. Turchynov also reminded the Russian Foreign Ministry of the biblical saying: " For all who take the sword will perish by the sword." He said that the armed conflict in eastern Ukraine would result in huge problems in Russia itself. He noted that the events in the eastern regions were not a Ukrainian conflict. "It's a hybrid war that Russia has begun against Ukraine, a war with the participation of the Russian security services and the army," Turchynov said. He also added: "Russia is doing everything possible to continue this war, reinforcing its military presence at the very moment when the Ukrainian army is close to victory."